Sara Khan’s show on Zee TV – ‘Ram Milaayi Jodi’ has been in the news lately with a change of the male lead opposite her from Nishant Malkani to Sujay Reu amidst much controversy. The show seems to be buzzing again, what with celebrities being roped in for cameos in the upcoming Mahaepisode on Saturday, September 10. The current track of the show reveals Sara’s character Mona getting all kicked about participating in a couples’ dance competition that’s come to town. 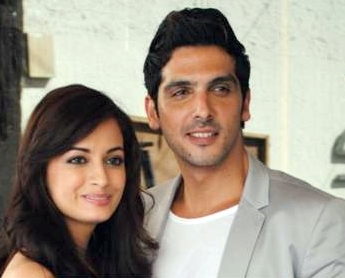 So she and her shy, reluctant hubby Anukalp land up at the venue only to realize that their favorite stars – none other than Dia Mirza and Zayed Khan are the judges of the competition. So while they’re overjoyed at their chance to shake a leg in front of the stars, they will face stiff competition from some more TV celebrities specially roped in to participate in the contest – Shakti Mohan, Manit Jaura and Rakshanda Khan. Promoting their upcoming release “Love, Break Up … Zindagi” with a vengeance, Zayed & Dia are looking to tap the reach of a popular television show such as Ram Milaayi Jodi on the eve of their release. Their cameo will be light-hearted and fun in spirit, whereby they will engage in comical banter with the dancing couples. While Manit Jaura and Shakti Mohan will do a salsa number, there will be Bhangra and Dandiya acts to bring out the Gujarati and Punjabi flavors the show is known for. The piece de resistance will be a romantic act between Mona and Anukalp that will leave Dia and Zayed speechless! Stay tuned to a fun-filled action-packed Mahaepisode of Ram Milaayi Jodi at 9 PM on Saturday, September 10, only on Zee TV.